Happy Wednesday to you all and here's a little something you don't find many fantasy footballers talking about: kickers. Guest writer Bob is back today with some advice on securing the best kicker for your lineup in Week 9. Advice on placekickers, you say? C’mon, everybody knows you can’t really predict how a PK will score from week to week, don’t you? I’ve heard that a lot in fantasy football circles, but I disagree. There are a few indicators that can help you pick the right PK week to week. As such, you can do some streaming with PKs just as you might with DEFs. So I’m crunching the data, and here are some indicators that I believe can be used to predict success. IT’S GOSTKOWSKI: First of all, Stephen Gostkowski is pretty good. He is averaging 14 points a game, and the only week he had less than 11 points was week 4 when KC pasted the Patriots. So NE was playing from behind and went on 4th down a couple of times to reduce Gost’s points. Which brings us to the second observation. NOT AGAINST HIGH OFFENSE: Don’t start PKs that are playing against high scoring offenses. The average points per game of all the PKs this year so far is 9.36. The points per game against DEN is 6.57. The points per game against the high flying Chargers even less, 5.37. The problem with a PK scoring against a high scoring offense is that the opposing team is likely to be playing from behind. And when you’re 14 points behind, you’re going to give up the 3 points for 4th down plays that may help you get the touchdown. Particularly when you’re in the red zone. Some people believe you don’t start a PK against a top defense. But the data this year doesn’t prove that to be consistently true. However, it does show that a PK that is playing against a team that has a high scoring offense AND a good defense is trouble. How about starting PKs on high scoring offenses? That’s a double edged sword. On the one hand you have an offense that is going to get you near the end zone consistently. But you have the problem of high scoring offenses scoring TDs in the red zone and not leaning on the PK for field goals. Let’s look at the four highest scoring offenses. McManus is averaging 7.28 per game, and Nick Novak is averaging 9.8, just barely over the league average. Bailey is averaging 12.7, over the average. And Vinatieri is right at the average, at 9.3. So this isn’t really the best indicator, but it is probably the one used most often by players that pick and hold a PK. YES AGAINST BAD OFFENSE: How about starting PKs against a bad offensive team? Here we have some correlation. Notice that the average is mostly at or above the league average of 9.36. YES FOR REALLY GOOD KICKERS: Finally, you’ve got to take into account just how good a PK is. If a PK can consistently hit the long ones, a team is more likely to go with the 3 points than punt. So long kickers play into the formula as well. And PKs that miss FGs that should be made, are bad bets under most circumstances. Be careful analyzing FG % made. This can be misleading, because some of those misses may be long yardage attempts, given to PKs that have a good range. Phil Dawson and Blair Walsh have missed 3 FGs this year, but that’s because they are both known for their big foot, and have been given attempts that other kickers would never have received. Justin Tucker, on the other hand, has missed some he should have made and Mike Nugent has missed 6 FGs. Watch out for those two. So given those considerations let’s look at the Week 9 top scoring PKs and see if there are any opportunities outside of the top 12, or bye week fillers. First, notice the five highest owned are all high offensive teams. That just shows that a lot of players simply pick and hold PKs on high scoring offenses, even though there is no clear correlation week to week. And Novak is not a good start and Tucker is on shaky ground this week. 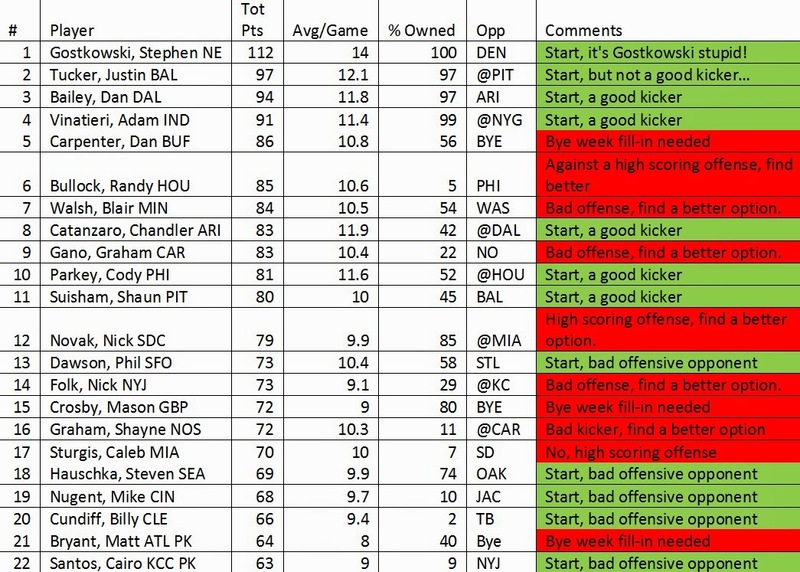 So given the analysis above, here are my recommendations for bye week fill-ins and better option matchups. If you don’t have any of the top 12 PKs shown as a start, start the following PKs, listed in order of highest potential. Phil Dawson SF, Mike Nugent CIN, Cairo Santos KC, and Billy Cundiff CLE. Hauschka is a great start but already owned in 74% leagues. Good luck to all in Week 9, and don’t forget about the kicker!!! THANKS!! I am always trying to find that perfect kicker who can make the long ones and plays for a team that always gets close to the red zone but just can't make the TDs. If I could find that guy he would be golden !!! Yeah, and who's home stadium is indoors!!! Ghouls? Goblins? Nope, it's Start/Sit, baby!